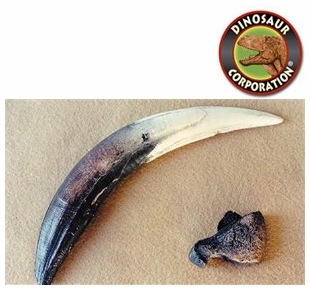 Saber Tooth Cat canine and claw. Smilodon fatalis also called Saber Tooth Tiger from the La Brea feline carnivore of Pleistocene Southern California. LACMNH license. Saber Tooth Cat also misleadingly known as a saber-toothed tiger is any of various groups of predatory mammals related to modern cats (or resembling cats) that were characterized by long, curved saber-shaped canine teeth. These animals belong to taxa of Machairodontinae (Felidae), Barbourofelidae and Nimravidae (both Feliformia), as well as two families related to marsupials that were found worldwide from the Eocene epoch to the end of the Pleistocene epoch 42 mya � 11,000 years ago.